Prepare to “rock out” like never before in Rock N’ Roll Climber. 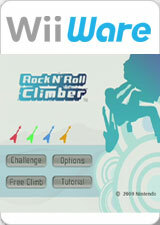 Climb rocks using the innovative control scheme, which has you controlling your character’s movement using the Wii Remote and Nunchuk. If you want an even more immersive experience, optional support for the Wii Balance Board is also available. Make your way up an array of courses, ranging from the Pop level’s indoor rock wall to the Heavy Metal level’s waterfalls (watch out for those moss-covered rocks—they’re slick!). In addition to the sense of accomplishment you’ll feel upon reaching the top, you might just be rewarded with your own guitar! The graph below charts the compatibility with Rock N’ Roll Climber since Dolphin's 2.0 release, listing revisions only where a compatibility change occurred. This page was last edited on 26 January 2018, at 08:56.